Sometimes it seems like you can’t fix up your home without a lot of money. New couches are pricey, after all. I think we all have projects that were delayed because we just can’t afford them. I know I do! The good news is that you don’t need a lot of money to have a fabulous home. 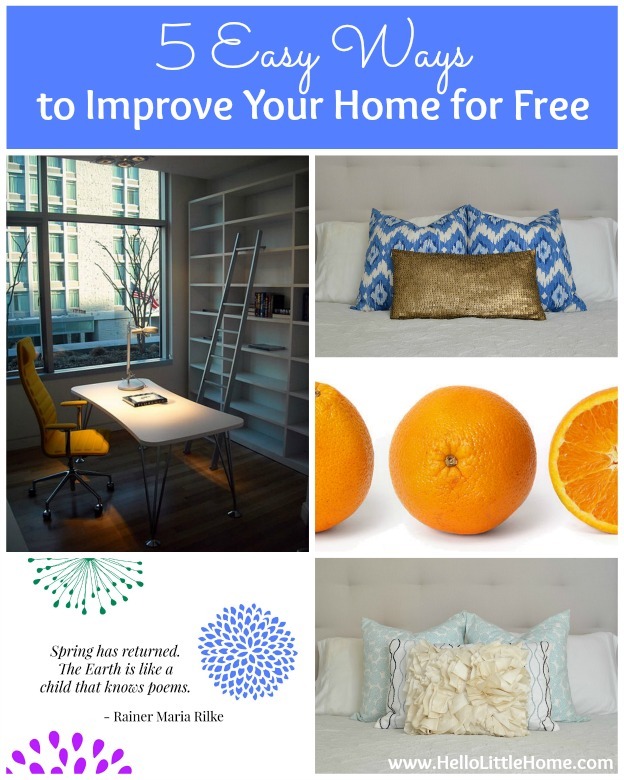 Here are 5 easy ways to improve your home for free. Yes, no $$$! FYI … that’s not my desk! Okay, I know what you’re thinking: boring! Hear me out though. 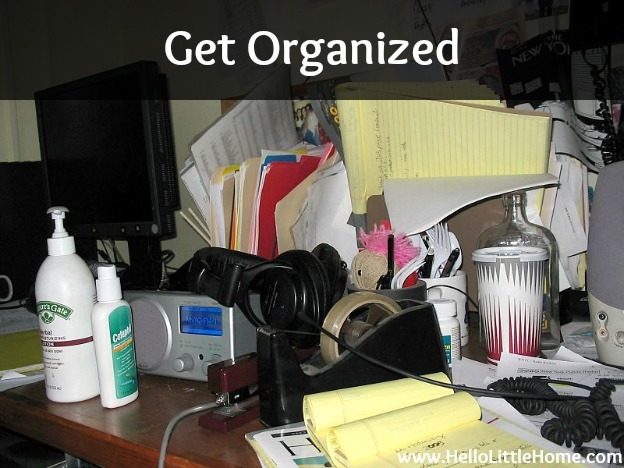 Don’t you love your home just a little bit more when everything is organized and clean? Confession: I am a really messy person. I wish it wasn’t true, but it is. However, anytime I get my apartment clean and organized, it just makes me happy. So, find that one closet, drawer, or corner that’s been driving you nuts and get to work. Start by emptying it out and getting rid of stuff you don’t need. Then put it back in (neatly!). You can use containers you already have laying around the house, like jars or shoe boxes, to hold everything. Do you need some inspiration? Check out my bedroom and hall closet makeovers, and find out how I organized my jewelry. I’ve also shared some tips for organizing a small closet, and my Get Organized/Clean Pinterest board has lots of great ideas, too. When I was a kid, my mom rearranged our furniture all the time. I have very distinct memories of pushing a huge couch into just the right position! 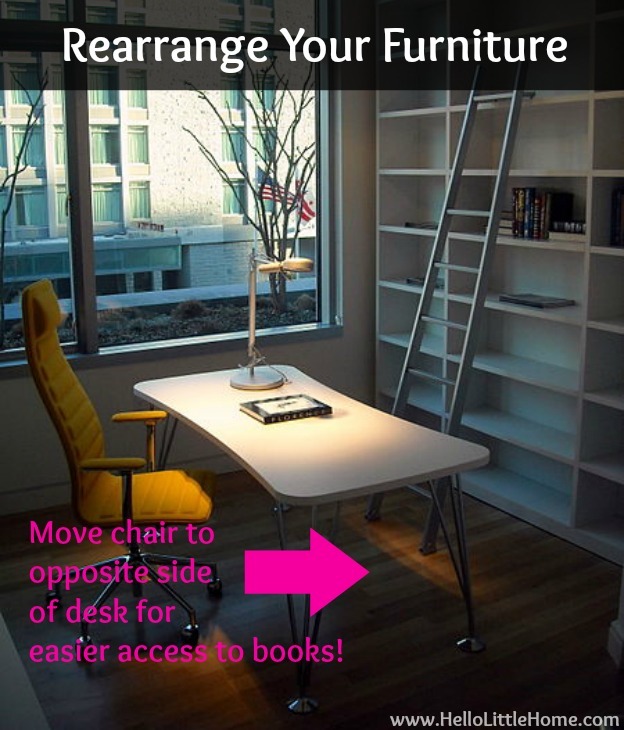 Rearranging your furniture is an easy and fun way to change things up. Why not try moving your bed to a different wall or even move a chair from a bedroom to your living room? Get creative, and if you don’t love it, you can always move it back. If you don’t want to torture your kids, just get some EZ Sliders (affiliate link). I love those things! If you live in a really tiny place like I do, you might not have a flexible floor plan. Most of my furniture cannot be moved anywhere else. There just isn’t room. If that’s the case for you, too, why not try swapping out some of your accessories? Recently, I moved the pillows from my living room into my bedroom and vice versa. I probably won’t keep it that way forever, but it’s a nice change for now. You can do the same in your own home. In addition to moving pillows around, try reorganizing your bookcases, grouping a collection together, or moving around knick knacks. 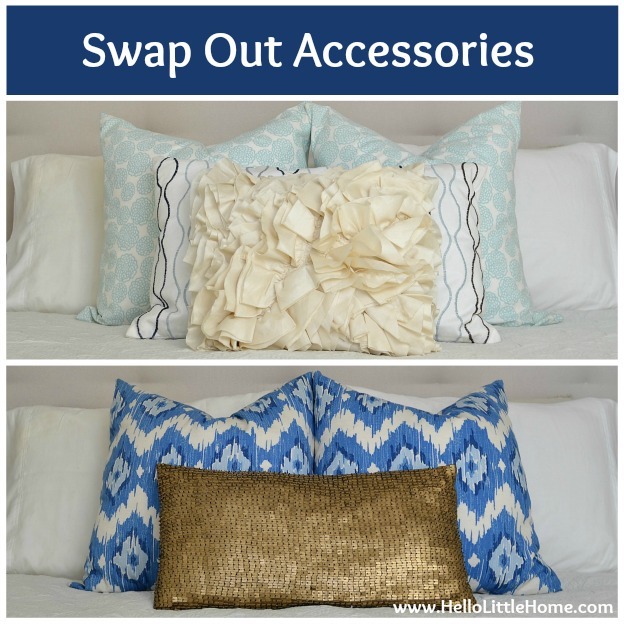 Swapping accessories in your room is equivalent to changing your jewelry. Think of the possibilities! Check out these links for more inspiration: 9 ways to organize books and 20 great collections and ways to display them. You don’t have to be a creative genius to make your own artwork. It could be as simple as framing a favorite letter, magazine clipping, or random ephemera (movie tickets, stamps, etc.). However, if you do want to break out the paintbrushes, why not try abstract art? Here’s a great roundup of 10 DIY ways to create abstract art. You can also use programs like PicMonkey to make your own masterpiece (no painting or drawing required). That’s how I created the image above. 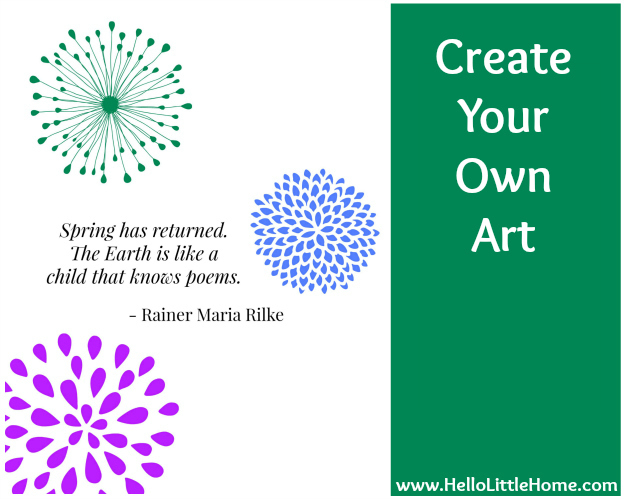 Get a free copy of my Spring Has Returned printable here. My DIY-Art Pinterest board has lots of fun ideas to spark your creativity. Finally, there are tons of printables (like my print above) available for free on the internet. 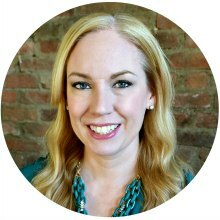 Check out my Printables Pinterest board, or just do a Google search and see what comes up! This might be my favorite idea! 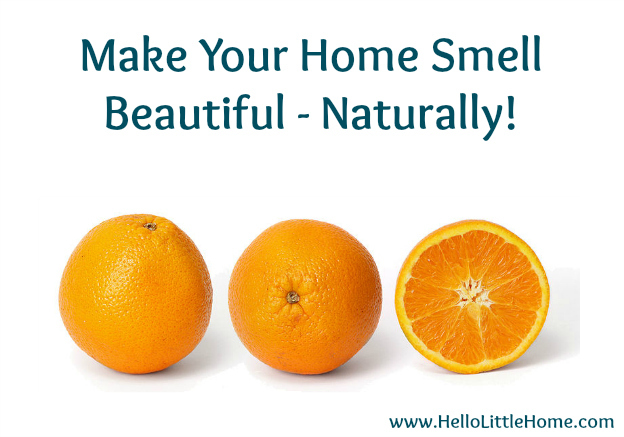 Scent has a powerful affect on our mood, so why not make your home smell as good as possible? I don’t know how warm it is where you live, but here in New York, I’ve been keeping my windows open (just a crack) as much as possible. It’s so nice to air things out after a long, cold winter. After you refresh the air in your home, introduce scents made with all-natural ingredients that you already have in your kitchen. Check out this post on DIY Room Scents, and learn how to use citrus, herbs, and spices to make your home smell amazing. I hope that I inspired you to make a few small changes to your home and save some money, too! What is your favorite way to improve your home for free? I thrift and try to DIY to decorate. It’s hard though because we budget and it still costs some money to do those things. Thanks for sharing these ideas! I like the accessory swap idea. One could always make new ones out of old clothes too. Great tips, and doable for all of us. Thanks for sharing at Fridays Unfolded! These are great ideas! Sometimes the littlest change can make a big difference! Thanks, Marti! It really is amazing how the tiniest change affects a whole room, isn’t it? Thanks, Marty! Have a great week! I stopped reading when I got to the open the window part and opened my windows! 😀 Listening to the birds and hearing the wind chimes is enough to boost my mood even the though the house is a mess! Next step pick something up! 😀 It’s so hard to keep on track with keeping your abode in a peaceful state but it really does affect everything! Thank you for all the tips! Def doing some more of these today!!! I’m so glad to hear someone is taking my advice, Heather;) Picking up isn’t quite as fun, but it definitely helps! Isn’t it amazing how these little things can boost your mood?